It’s times like these we look for comfort in our dear family and friends and try to find sanctuary (maybe in a park or library). Perhaps we may find some good in the world, or better yet, DO good (of course, we already know that librarians do good in their communities every day!). I hope these books about kindness can give you just a moment of distraction. Like to party? How about party with a purpose—to give back! 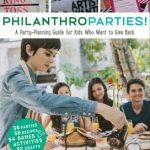 Check out Philanthroparties: a Party-Planning Gide for Kids Who Want to Give Back . That is what this is all about! As the author explains, “It’s what happens when you connect hanging out with helping out” This 194 page book is by now 18 year old Lulu Cerone, who, was so effected by the news during the 2010 Haiti earthquake that she learned to channel her dismay into something positive—fundraising and raising awareness . This book gives me hope that young people want to make a difference in the world! Cerone includes 36 theme parties with recipes, games, activities and crafts sorted by month and includes other ideas. It’s a great way to channel kids’ energy and now is a great time for that. 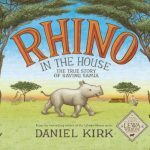 And another book that is as uplifiting as a party in the house is Rhino in the House: The True Story of Saving Samia and I love the fact that part of the proceeds do go to a Wildlife Conservancy! Although the format is picturebook, the illustrations are large enough for storytimes and class visits plus it has some color photos in the back. Don’t worry—there is not too much text but enough to relay the humorous adventures Anna Merz (a retired conservationist in South Africa) and Samia (a rhino) shared and it will garner some laughs. Part of the charm comes from David Kirk’s (Library Mouse series) illustrations. He captures the rhino’s expressions of worry and eventual contentment. This is a warm, cozy read. 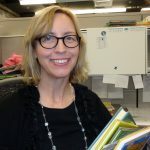 Erin Wen is the Materials Selection Librarian (Youth) for Dayton Metro Library. She and her husband have wayyyy too many cats and she adores animals, cemeteries, gardens, soft pretzels, and, oh, books (especially non-fiction!) She spends many hours at ewen@daytonmetrolibrary.org. Thank you for this post! I hadn’t seen the “Philanthroparties” book yet. It looks amazing! Have you read “If You Plant a Seed” by Kadir Nelson yet? It’s another, truly wonderful book about kindness. I told my storytime patrons I believed this book could possibly save the world 🙂 The text is quite spare, but the illustrations are incredibly evocative. I highly recommend it!